A grisly scene in Philly last night. In case you missed it, midway through the third period of last night’s contest between the Vancouver Canucks and Philadelphia Flyers, veteran Canucks defenseman Alex Edler got tangled up with Flyers forward Jakub Voracek and took a nasty spill on the ice. He appeared to lose consciousness and had to be taken off the ice on a stretcher. That’s… that’s difficult to watch. The way his body twists and the force behind his head when he hits the ice… it’s gruesome. While Edler was on the ice, a pool of blood formed around his head and some Flyers fans close to the glass managed to snap photos. Thankfully, Canucks rookie Elias Pettersson and goalie Jacob Markstrom managed to scare them off, reprimanding them for taking photos of the grisly scene. 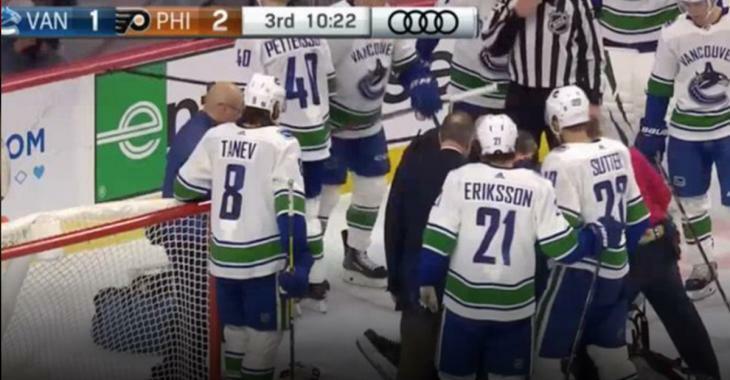 It should be noted though that Edler was stretchered off the ice to a standing ovation from the Philly crowd and Voracek himself gave him a pat and, presumably, apologized.